In the series of Naga Leaks posted by We Are Collective, the former and late Naga City Mayor Jesse Robredo is said to have had a mistress and illegitimate children. The Collective divulged that Jesse’s mistress is Dalisay J., a sibling of a certain Ligaya. 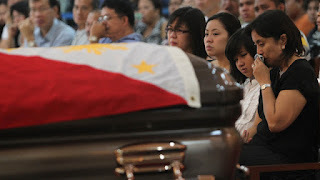 The mistress was even said to have been present during the wake of Jesse and was weeping more than Jesse’s wife, Vice President Leni Robredo. The Collective staunchly claims the veracity to this information on Dalisay J. even saying that, “Leni, tamaan pa kami ng kidlat kung nagsisinungaling kami! Wag mong sabihing hindi mo alam ito." Jesse’s mistress mars his credibility as a recipient of the Ramon Magsaysay award, the Collective claims. "At ito namang Ramon Magsaysay Award. Ba't di kayo nagsaliksik nang maigi bago kayo nagbibigay ng parangal sa isang tao? Kung alam nyo ba na may 12 kabit at anak sa labas itong si Jesse paparangalan nyo parin at ituturing na kapitapitagan?" their post said. Despite these exposes, Leni and her camp remains mostly quiet. She is documented to have only said that these exposes “will not silence” her, and yet, as netizen Krizette Chu posted, "...they slink away and hide. They deactivate and hope for this to go away. They don't reply. They don't sue. They don't hold press conferences when press conferences have been their favorite tool to discredit and slander Duterte."